Thanks, I really appreciate that. I would probably buy a "donor gun" that had that and maybe a few other parts. One of these would be a pain to make but it is the only part that am missing from having a 747 that had been Fired about 25 times before my friend (deceased) decided that he was going to put a pistol scope on it and thought that he was dealing with aluminum until he put a little heat on it. He threw the halves away and was "going to" order new ones but never did. 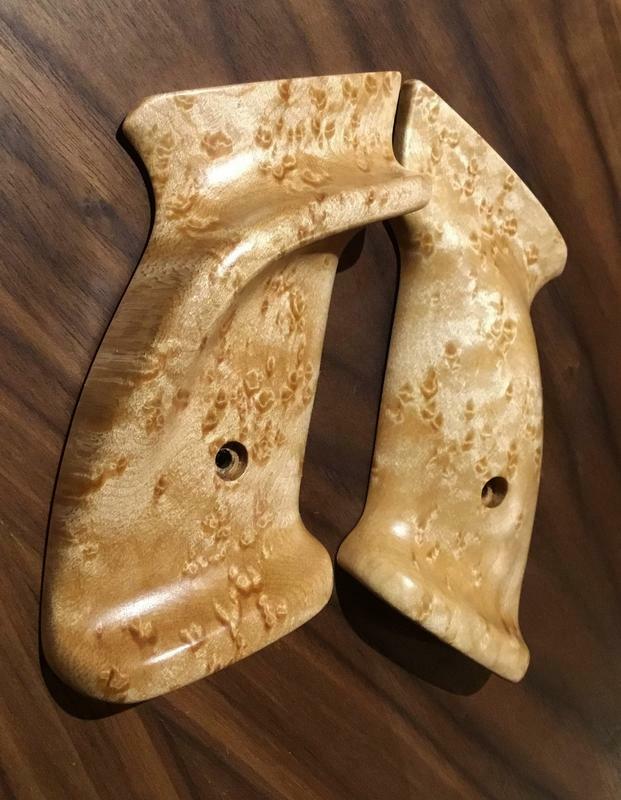 Well, I received my left hand grips today from Vernon Austin, he sent me several pictures of them before shipment and I was impressed. BUT, there is nothing like "meeting them in person", they are far above what I expected. I have quite a few handguns and I don’t believe that I have any to rival them they are perfect in every way. Thanks guys for letting me know about his fantastic work! Vernon is something else isn't he ? , I need to open up my wallet , let the moths out and purchase some more from this artist , enjoy them , they will last forever . Nice , just had my SSP 250 with the Vernon Austin furniture on it out last night , man he does some great work , mine are in what he calls camo laminate , fit and finish are spooky good .